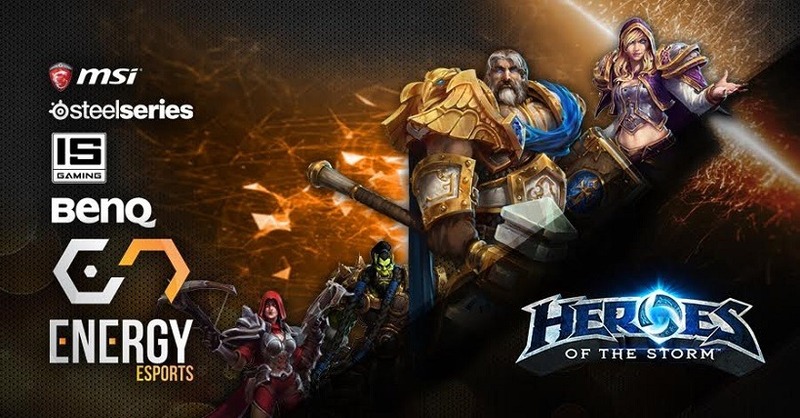 It’s a competitive game we haven’t really heard much about since its release from open beta earlier this year, but Heroes of the Storm is on the rise. With tournaments already underway throughout North America and Europe, it was only a matter of time before South Africans picked up on Blizzard’s answer to the competitive MOBA. A few weeks ago Ventus Gaming posted on their Facebook Page that they are having open tryouts for a Heroes of the Storm team, but today we received word that Energy eSports have acquired a team, and it has some familiar faces. It’s an interesting move by Energy eSports since the South African scene has yet to really jump aboard competitive Heroes of The Storm. There has to be a justifiable reason behind it: perhaps a tournament or international exposure since the game is still in its grass roots. Johannesburg, South Africa – Heroes of the Storm, Blizzard answer to the popularity of MOBAs, has slowly started rising as a competitive eSports tournament. The simple, yet complex title involved Heroes from the rich lore we know and love throughout Blizzard’s titles. The five-a-side battle arena has already been picked up as an official eSport, with a few tournaments under the belt, and now with the burst in popularity Energy eSports have decided to include our very own team in the roster. The team is comprised of familiar faces in the South African MOBA scene, some of which used to be part of our Dota 2 team, and hope to compete both locally and internationally. Owner and Manager or Energy eSports, Kas Ahmed, welcomes the new team and wishes them all the best as they fly the Energy flag. We look forward to the future prospects of having an official Heroes of The Storm team, and wish them the best of luck both locally and internationally. Some of you may remember RandomHero from our CS:GO Pro Guide, well now we can hopefully get a Heroes of The Storm Pro Guide. Heroes of the Storm is unlike any other MOBA out there. It’s also extremely new, and for once we have a chance to get going right from the start as the new game reaches out into the competitive world. HotS is also pretty easy to get good at, as players have told me. With Counter-Strike and Dota we struggled to leave our mark internationally as those teams were born and bred into those competitive titles, HotS is new and I believe we can do it. We caught up with RandomHero to chat about his return to Energy eSports and their plans moving forward. “I was approached by a couple of my old Dota 2 teammates to start up a team for HotS, who recently started playing it again. We used to play it religiously but stopped and forgot about it during the time leading up to last year’s NGL Dota 2 event, since we had to spend all of our time practicing for the event. For the moment our plans are to start practicing and start entering cups on the international circuit and just build up as much experience as we can. The South African community is quite small and undeveloped at the moment, but as time goes on I am going to personally put in a lot of effort in to growing HotS in the South African scene. I’m already trying to figure out different ideas for tournaments / leagues. For now I just want to thank Energy and the sponsors for giving our team this opportunity and hope to do our best. HotS could be our big break, and I plan to follow these guys pretty closely to see how they perform internationally, knows they may even get that famed invite to Blizzcon. They’re all really experienced MOBA players, and once more teams start emerging I think we might have a pretty exciting scene in South Africa. Do you think there’s room for competitive HotS in South Africa?